High power industrial applications such as solar inverters, uninterruptible power supplies (UPS) and motor drives demand a gate driver optocoupler capable of handling networks greater than 690VAC and constant DC voltages greater than 1000VDC. In order to achieve this, a creepage and clearance distance of 10mm or greater is essential. Similarly, applications such as Harsh Environment Inverters (HEI) also require wider creepage and clearance distances even with a 690VAC network. To help designers meet this challenge, Fairchild Semiconductor developed the FOD8320, an advanced 2.5A Output Current Gate Driver Optocoupler. 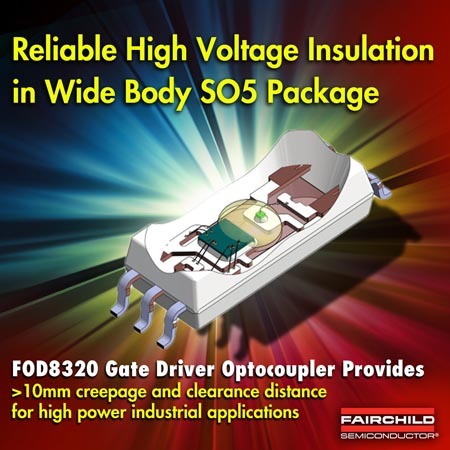 Using Fairchild's Optoplanar® packaging technology and optimized IC design, the FOD8320 optocoupler achieves reliable and high insulation voltage as well as high noise immunity. The device, housed in a wide body 5-pin small outline package, offers a compact footprint while allowing for a creepage and greater than 10mm and 0.5mm internal insulation distance. Additionally, the FOD8320 provides an extended industrial temperature range (–40 to +100°C) and is ideally suited for fast switching of power IGBTs and MOSFETs used in industrial inverter applications. Designed with 35kV/µs minimum Common Mode Noise Rejection (CMR) resulting from the proprietary Optoplanar coplanar packaging technology, the FOD8320 eliminates the capacitive charge buildup that occurs in the over-under construction.